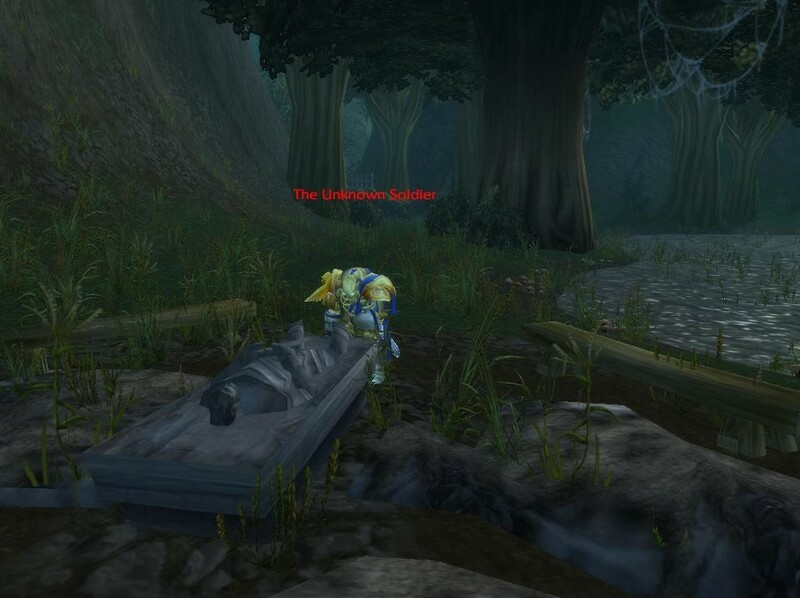 Episode #49 Timecapsule: After the Shattering of Azeroth, an interesting change occurred at the hidden gravesite of Beggar’s Haunt. Found in northeastern Duskwood (at coordinates 90,30), explorers will find an elite NPC spawn called The Unknown Soldier. With no known quest or lore ties in Azeroth, this mysterious creature may be a symbol of all brave loved ones who have fallen in battle. This entry was posted	on Tuesday, May 31st, 2011 at 12:53 am	and is filed under Podcast Episodes. You can follow any responses to this entry through the RSS 2.0 feed. You can skip to the end and leave a response. Pinging is currently not allowed. This made me cry, its beautiful..really touching. Wonderful wonderful. First time visitor here, I’ve just spend about an hour rolling and listening to some of the entries. The Beggar’s Haunt has been a favourite spot of mine for a long time. I spent about six months in a now-dead RP guild on Defias Brotherhood-EU, The Dark Sphere. It was a rather enjoyable guild of cultists and practitioners of forbidden magic – the leader for most of the time I was there, Mordazan, understood that it’s almost impossible to get such a guild to genuinely work towards any one goal for any length of time, and that we as self-assigned antagonists could never really win long-term, and so we existed as a perpetual thorn in sides more than anything else. We held our meetings at Beggar’s Haunt, just out of sight, just off the beaten track, a stone’s throw from Stormwind, but so hard to find unless you knew it was there. Nowadays, when I fly over, I occasionally land and recall a few of my favourite times from the Sphere. The first time I encountered the Unknown Soldier after the Sphere disbanded (happily, I might add – we felt our numbers were growing thin, and rather than die slowly, we died well.) I said a few words before I left. Begone, shade of the past. Do not stand watch for our Darkmaster, do not dream of the Soulblighter. Their times have passed. Go to your rest, your time, too, has passed. This is actually Blizzard’s tribute to the legendary finnish book author Väinö Linna’s great tale called The Unknown Soldier. The book tells about what happened in Finland during The World War II.